The getting ready portion of the day can be the most exciting and busiest time of the wedding day. While this bride was getting ready, the entire room was lively with action! There were 25 people in the room including the bridesmaids, her parents & extended family, and two separate video crews. Chris wanted to get a shot of the bride putting on her makeup in the mirror but the foregrounds and backgrounds were so busy & cluttered. To bring some simplicity to the chaos, he used the bride’s black hair to create the negative space on the left of the frame. 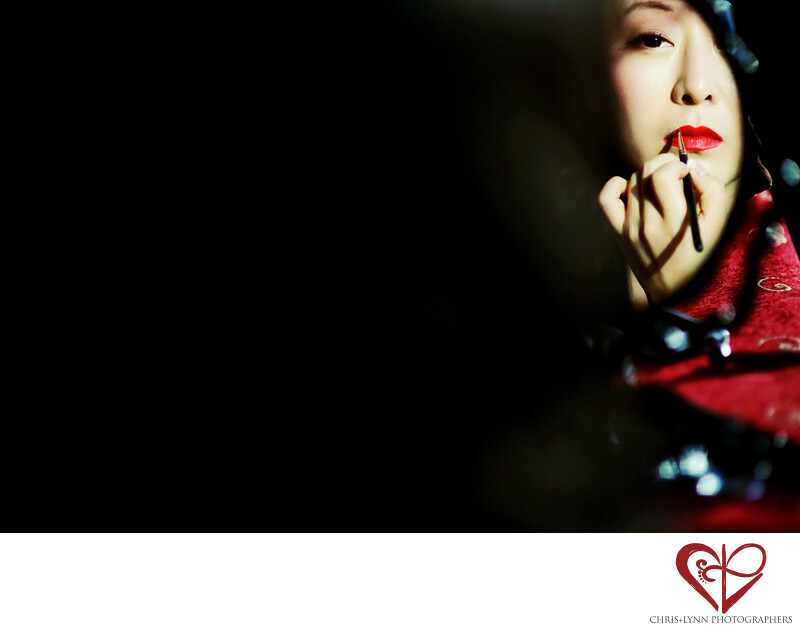 The large expanse of darkness lead the eye to the bride’s reflection and contrasts with the red lipstick. The light bouncing off the lips made the red pop even more. This image was one of the first shots of the day (which began at 6am) and set the tone for a really creative wedding that lasted for the next 18 hours! This Chinese destination wedding was one of our all-time favorite destination weddings. It was featured on the Junebug weddings blog here. A large selection of images from this X'ian wedding can be found on the Featured Weddings section of the Chris+Lynn website here. Location: Xi'an, Shaanxi, China, 710061. 1/5000; f/1.4; ISO 800; 85.0 mm.